BlackBerry Trade Up Program Launched | BlackBerry Blast! 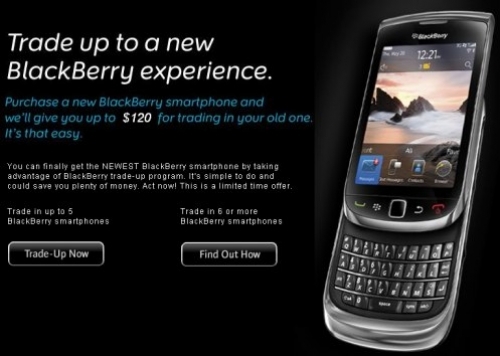 RIM has announced a new program for BlackBerry customers in the US that allows you to essentially sell your old BB back to RIM. The BlackBerry trade-up program allows customers who purchase a new, eligible BlackBerry, to receive money back for trading in their existing eligible BlackBerry device. So in order to take advantage of the program the phone you currently have, and the new phone you want have to be on the elligible list. Users can receive up to $120 back when trading in an old device. Most of the more popular BlackBerrys including the Bold 9670, Torch 9800, Pearl 3G and 9700/9780 are on the list. Check out the blackberrytradeup.com site at the link below. You can ask for a quote and then track the process along the way. Pretty cool RIM!